Accompanied by the Sinfonietta Cracovia, French harpist Xavier de Maistre performs Joaquín Rodrigo’s Concierto de Aranjuez, a composition for classical guitar and orchestra. Conductor: Jurek Dybał. Recorded at the ICE Krakow Congress Center on November 23, 2014. Composed in early 1939, in Paris, amid the tensions of the impending war, it was the first work Rodrigo wrote for guitar and orchestra. The instrumentation is unusual: rarely does the guitar face the forces of a full orchestra. Thus, the guitar is never overwhelmed. The premier of the Concierto de Aranjuez was held on 9 November 1940 at the Palau de la Música Catalana, in Barcelona. It was performed by the Spanish classical guitarist and composer Regino Sainz de la Maza (7 September 1896 – 26 November 1981) with the Orquesta Filarmónica de Barcelona conducted by César Mendoza Lasalle. Allegro con spirito The first movement’s 40-measure introduction begins with the solo guitar strumming a three-measure theme in 6/8. The theme is made of tonic, supertonic, and dominant chords and features a flamenco-like hemiola rhythm. As it repeats several times, the tonic chord’s uppermost note gets higher, starting with the third, then using the fifth, the tonic, and the fifth again. Adagio The second movement, the best-known of the three, is marked by its slow pace and quiet melody, introduced by the cor anglais, with a soft accompaniment by the guitar and strings. A feeling of quiet regret permeates the piece. Ornamentation is added gradually to the melody in the beginning. An off-tonic trill in the guitar creates the first seeds of tension in the piece; they grow and take hold, but relax back to the melody periodically. Eventually, a climactic build-up starts. This breaks back into the main melody, molto appassionato, voiced by the strings with accompaniment from the woodwinds. The piece finally resolves to a calm arpeggio from the guitar, though it is the strings in the background rather than the guitar’s final note that resolve the piece. Allegro gentile The third movement is in mixed metre, alternating between 2/4 and 3/4. At the beginning of the movement, four-measure phrases containing 9 beats in total are formed from one 3/4 measure followed by three 2/4 measures. As the movement progresses, the metre becomes more irregular. Xavier de Maistre (born October 22, 1973) is a French harpist. He started to study the harp in his hometown conservatory in Toulon when he was nine-year-old. Later he travelled to Paris to perfecting his technique with Jacqueline Borot and Catherine Michel as he studied Political Sciences and Economics at the London School of Economics at the same time. At the age of sixteen, Maistre won his first international competition in Paris and later was awarded several times at the international competitions held in Cardiff, Munich, Vienna and Jerusalem. In 1998 he got the first prize and two interpretation prizes at the Bloomington International Harp Competition, the world’s most prestigious harp competition in the United States. Later in the same year Maistre become the first French musician to join the ranks of the prestigious Vienna Philharmonic Orchestra. As a soloist, Maistre has appeared with numerous orchestras under the baton of such eminent conductors as Riccardo Muti, Daniele Gatti, Sir Simon Rattle, Sir André Prévin, Heinrich Schiff, Antoni Ros Marbà, Bertrand de Billy, Walter Weller, Gilbert Varga, Josep Pons and Philippe Jordan, amongst others. 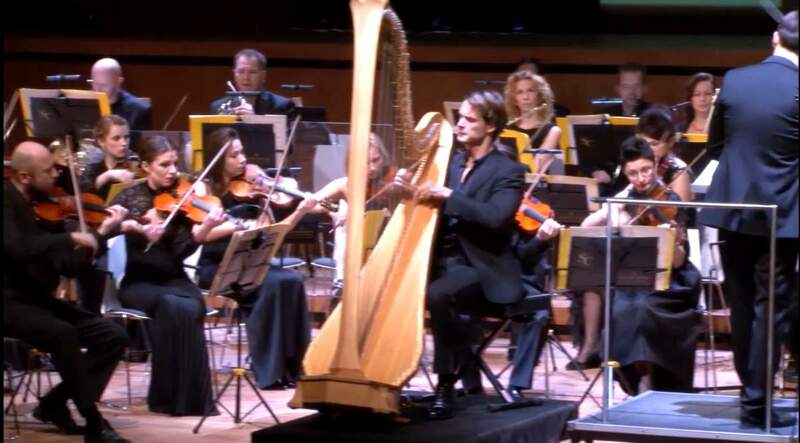 He became the first harpist to appear as a soloist at one of the Vienna Philharmonic’s subscription concerts In May 2002. Maistre has also been invited to perform at many of Europe’s leading festivals, including the Schleswig-Holstein, Salzburg, Rheingau, Vienna and Verbier Festivals, the Budapest Spring Festival and the Würzburg Mozart Festival. Among the artists he has performed with are Kathleen Battle, Ingolf Turban, Anne Gastinel, Diana Damrau and Barbara Bonney and actors such as Peter Simonischek and Andrea Jonasson. Among highlights of a tour with the Vienna Philharmonic Orchestra under the baton of Daniele Gatti in 2009, during Maistre appeared as a soloist at the Amsterdam Concertgebouw, the Cologne Philharmonie and the Vienna Konzerthaus; concerts with the Orchestre National de France under Riccardo Muti at the Théâtre des Champs-Élysées; a series of recitals with Diana Damrau at the Festspielhaus in Baden-Baden, Paris Opera, La Scala, and the Musikhalle in Hamburg and recitals with Bo Skovhus at the Semper Oper in Dresden, the Tonhalle in Düsseldorf and the Musikverein. Maistre has taught at the Hamburg Academy of Music since 2001. He gives regular masterclasses at NewYork’s Juilliard School of Music, Tokyo’s Toho University and London’s Trinity College of Music as well.